A recent study from the University of Massachusetts at Dartmouth has found the adoption of social media usage among Fortune 500 companies has leveled off. Across multiple industries, usage of Twitter, Facebook and blogs in 2011 is level with or below that of 2010. 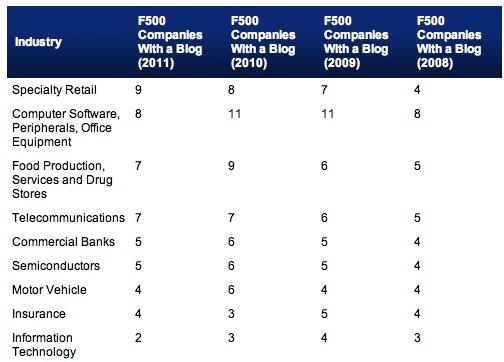 In 2010, 23 percent of Fortune 500 companies had a blog. In 2011, that figured remained unchanged at 23 percent. 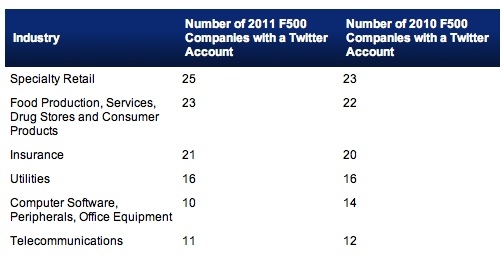 In 2010, 60 percent of Fortune 500 companies have a Twitter account. In 2011, 62 percent have an account. 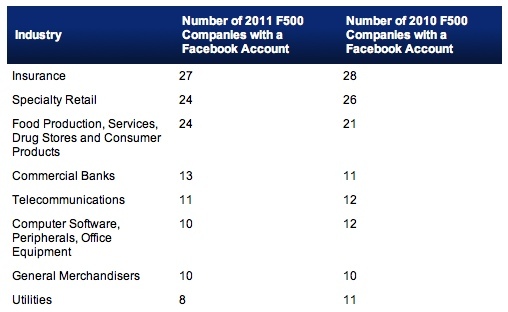 In 2010, 56 percent of Fortune 500 companies had a Facebook account. In 2011, 58 percent have an account. As Marketing Pilgrim notes, often times larger corporations adopt a wait and see attitude towards new methods or marketing opting, instead, to watch what smaller, more nimble corporations do. The larger companies then learn, fix and improve. Also of note, the shine is off the new object. Social media isn't new any longer. It's gone well past the experimental stage and now it, like everything else in marketing, is expected to contribute to a company's bottom line. And if it's not doing so, it's more than likely to be scrubbed. Over the course of the four years the study has been conducted, Fortune 500 companies always lagged behind Inc. 500 companies, charities and higher education, the other three areas this study examines. Perhaps it's just the inherent red tape that comes with large companies. Or the need for everything to be checked, double checked and approved seven times over. Neither of which sits well with social media's need to be in the moment, conversational and devoid of anything closely resembling red tape. Like a slow moving ship attempting to miss an iceberg, it just takes some companies longer than others to shift cultural and operational rudders.